Difference between revisions of "Open Metadata Search"
This Unit links the GUI with the internal units. This passes parameters from the GUI appropriately and displays the results accordingly. This unit is responsible for dealing with EMF. It has the ability of accessing the EMF models metadata and the EMF Index. This has two sub units. These units are the EMF Models Operator and the EMF Index Operator. 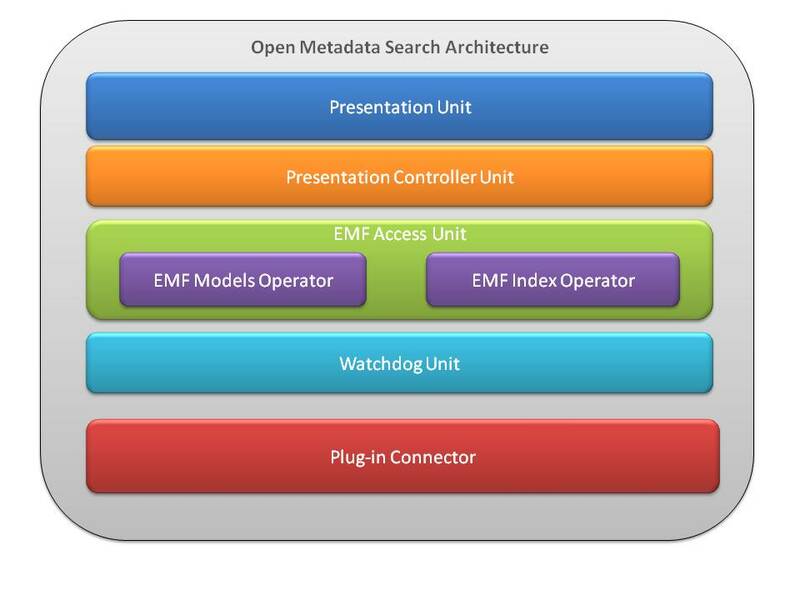 As the name implies the EMF Index Operator will be taking care of tasks related to accessing the EMF Index and the EMF Index Operator will be taking care of tasks related to accessing the EMF models metadata. These units are designed in such a way that they are highly extensible and inter-related. The basic functions of this unit is to trigger the system in order to get the latest EMF index. This will make sure that the index available for searching is the latest at all the time. This unit optimizes the performance by performing the index process as a background process. Open Type and Open Resource index searches in the workbench are one of the most widely benefited tools for many developers. Especially its enormous ability of locating the exact class and the file in a huge project is very helpful. If we can perform the same kind of a search for Java metadata also it will be so beneficial to general developers. It will be guaranteed that the developers get the hassle free most effective results on facts that they want to search for. This feature should be capable of being invoked by a dialog box (as it is in the case of the Open Type and Open Resource) A hotkey combination is also important so that the developers can access this feature easily. The developers should be capable of searching for the particular artifact by just typing a portion of the content or some other important aspect such as the name of it. This tool will perform the index search over the EMF models and it is expected to use the EMF index as well. Indeed this tool is more specific than that of a generic indexing system. It is expected that this will work in close relation and with higher compatibility with the other tooling as it is expected to perform the search over the Java metadata stored in EMF models rather than over raw files. The system uses a unit wise architecture. There are different units that are used to achieve desired functions. Refer to the Appendix A for the Architectural Overview. The functions that are implemented by each unit are independent of the other units but the communication is done between units. The functions that are expected from each unit are as summarized below. This system will be dealing with the EMF models very closely. It is expected to use some available open source frameworks at the different units of the system. The system is designed and implemented in such a way that there would be a higher degree of extensibility. The system design will be produces and accepted before developing and the system will be developed unit after unit so that it will be easier for mentors and other interested parties to receive intermediate releases. This system will also be developed in such a way that it will be flexible. The users will get the total ability to configure it according to their desire.